Here at Science Exchange, we aim to enable efficient scientific collaboration. One of the biggest hurdles researchers face on our site is deciding where to send their requests. Conversely, it can be frustrating for lab admins to receive requests outside their capabilities. With that in mind, we are working on improving our search experience. This update will be available at the end of next month. 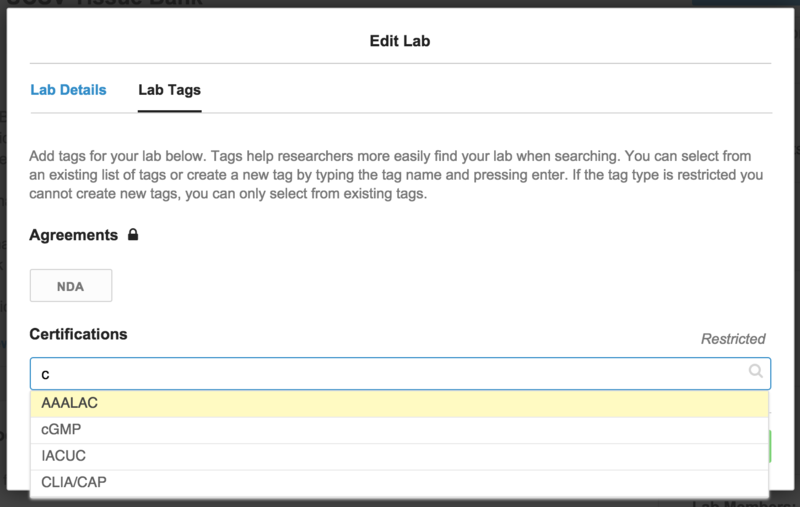 In preparation for our improved search experience, we’ve launched a tagging feature for labs. Labs can apply tags, such as equipment names, to their services, which will allow researchers to narrow their search to only labs that have the machine they need. Also, labs that have signed agreements with Science Exchange, like our Non-Disclosure Agreement, will receive storefront tags, allowing researchers who require that level of protection to quickly identify appropriate labs. If you’re a lab admin on Science Exchange, we encourage you to begin tagging your services and storefront now! This will ensure that researchers will be able to find your lab more easily with our new search experience. Certain types of tags apply only to an individual service you are providing; equipment tags, reagent tags and species tags. 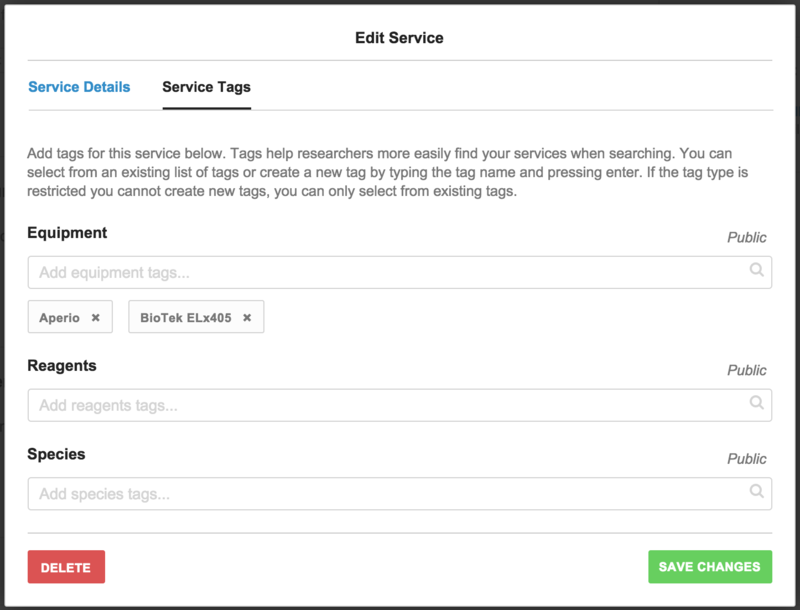 To add or edit service level tags click the edit service link next to the service you want to tag. Select the Service Tags tab. Type the name of a piece of equipment, a type of reagent or a species into the input field to search our tag database for relevant tags; click on the relevant tag that appears in the drop down menu. Once you have selected a tag, it will appear below the input field. You can contribute new tags to our database. To do this simply type the name of the tag you want to contribute and press enter. Make sure to click the save changes button to ensure your tag changes are saved. Once you have saved your changes you will notice that your service tags are displayed on your storefront as part of the information for the service you are offering. 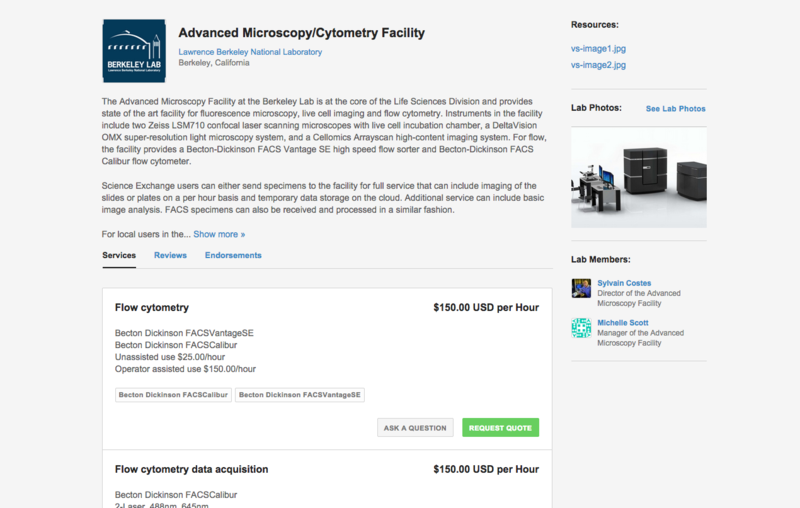 Take a look at the Advanced Microscopy/Cytometry Facility at Lawrence Berkeley National Laboratory for a good example of a lab with lots of equipment tagged on their services. Certain types of tags apply to your lab as a whole; certifications and agreements. To add or edit lab level tags click the edit lab button. Select the Lab Tags tab. The editing experience is the same as it is for services. You can also view any private tags, such as agreements, that we curate here. If you believe that a private tag has been incorrectly applied to your lab, please contact us and we will change it. Once you have saved your changes you will notice that your lab tags are displayed on your storefront. Displaying this information on your storefront helps to make your lab standout from the competition. 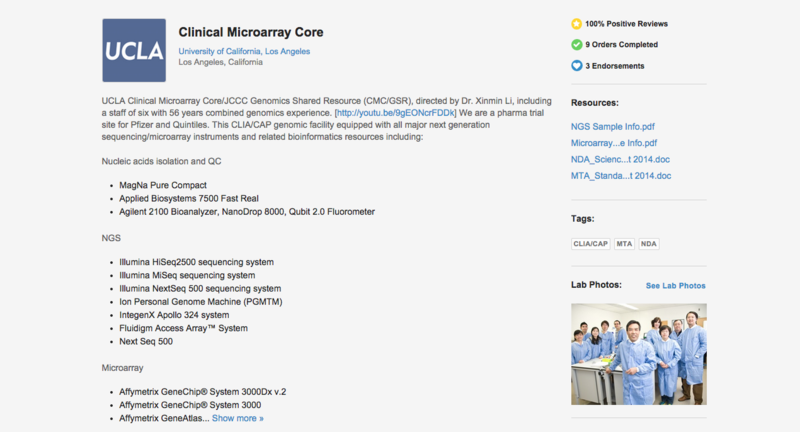 The Clinical Microarray Core at the University of California, Los Angeles is a lab you can view with storefront tags for both agreements and their CLIA/CAP certification. If you are interested in learning more about tagging, please check out our help center article. Also please feel free to contact us if you would like assistance tagging your lab or have suggestions for new tag categories. The more thoroughly you tag your lab, the easier it will be for researchers to find your services. Head to Science Exchange to start tagging your lab!